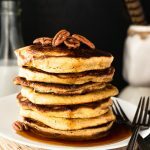 Fluffy and dense with only 4 ingredients, this plantain pancake recipe makes the perfect paleo and gluten free breakfast! Peel the plantains by cutting off both ends, then slicing lengthwise down the peel and removing it. Add the plantains and eggs to a high-powered blender. Blend on medium, increasing in speed, until the mixture is smooth. Combine cassava flour and baking soda in a medium bowl. Pour the plantain mixture into the dry ingredients and stir until completely combined. Heat 1 tablespoon ghee, butter, or olive oil in a skillet over medium heat. Once heated, add about 1/4 cup of batter to the skillet. You may have to spread the batter out a bit to make a thinner pancake – this batter is thick! Flip after 2-3 minutes or once bubbles start to appear on the edges of the pancake. Cook for another 2-3 minutes, then transfer to a plate. Repeat with remaining pancakes, using additional ghee, butter, or olive oil as necessary to oil the skillet between batches. Serve pancakes with fresh fruit, toasted nuts, or a drizzle of pure maple syrup.